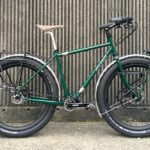 You’ll find a few touring bike creations from Joseph Ahearne’s workshop already on CyclingAbout, but I always have time to feature another. That’s because Joseph goes to great lengths to incorporate fine detail into each of his builds. This particular off-road touring bike, sometimes known as an ‘Outback’, is a fine blend of modern technologies with classical styling. Everything from the drivetrain to the tyres, rims, lights and handlebars is positively 21st-century; but the bike could somehow go unnoticed between a handful of touring bikes from decades ago. Let’s take a closer inspection. Starting at the front end, the most striking feature to me is the triple plate fork crown. This takes me straight to a particular artefact at the Smithsonian National Air and Space Museum. You know the Wright Brothers who are credited with creating the first successful aeroplane? Well, they started in the bike business, and their most famous bicycle build also employs a triple-plate crown! While Joseph usually constructs his own racks, this Outback is using stock Tubus racks. That’s no bad thing, the Tubus steel racks are often half the weight of everything else available and offer a 30-year guarantee to boot. You will, however, find a custom fender strut that mounts the ultra bright B&M IQ-X light in a high but forward position above the front wheel. The wheels are another talking point. This touring bike is using Derby 35i carbon fibre rims. 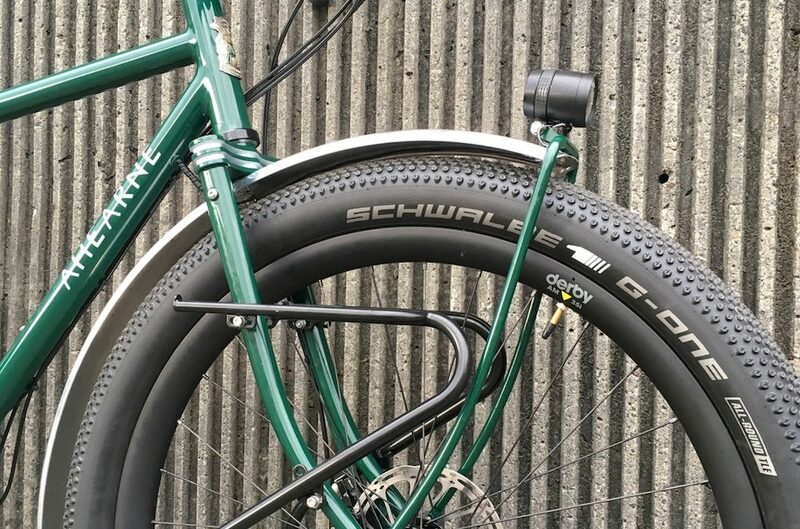 Not only are these rims ultralight (485 grams), but they’re also super stiff and wide, matching appropriately to the Schwalbe G-One 27.5 x 2.8″ tyres. The tyres are pretty special too as they’re one of the only gravel-specific tyres in this wide dimension. A series of micro knobs create a much lower rolling resistance when compared to standard plus tyres that are designed for trail use. That will make this bike perfect for rough roads like the Pamir Highway in Tajikistan or Carretera Austral in Chile! The frame breaks into two halves to reduce the pack-size for flying. S&S couplers fitted to the top and down tubes permit the bike to fit into a box with regular check-in baggage dimensions (26 x 26 x 10″). This means no oversized baggage fee and makes travel to and from the airport logistically easier. The Honjo H-95 fenders are wide enough to clear the plus-sized tyres… with space. 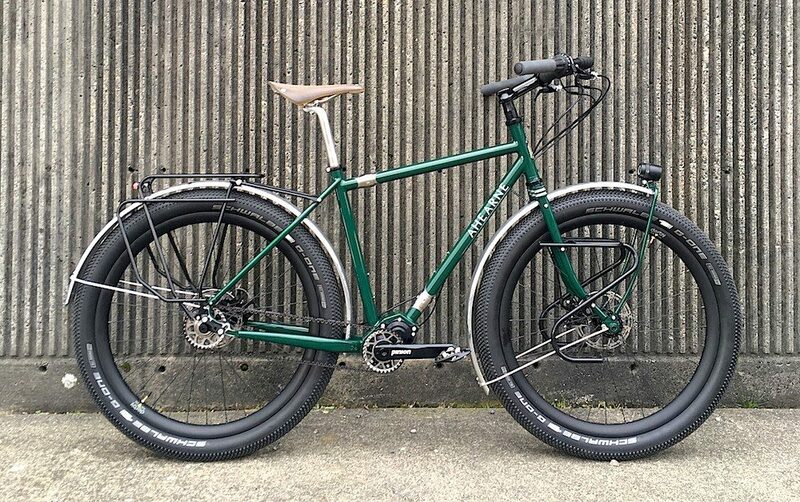 Over my years of bike travel, I’ve found fenders to be absolutely invaluable – it’s cool to see fenders on fat-tyred bikes too! That motor-looking component is a Pinion gearbox. This is a replacement for derailleur gears on a regular bicycle. A series of cogs sit inside a weather-sealed container with 18 different gear options. 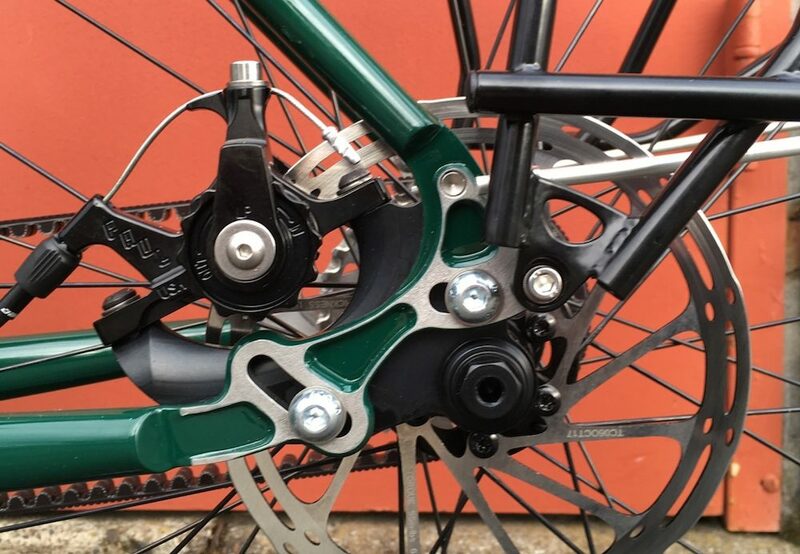 It actually offers a gear range wider than any derailleur system too. 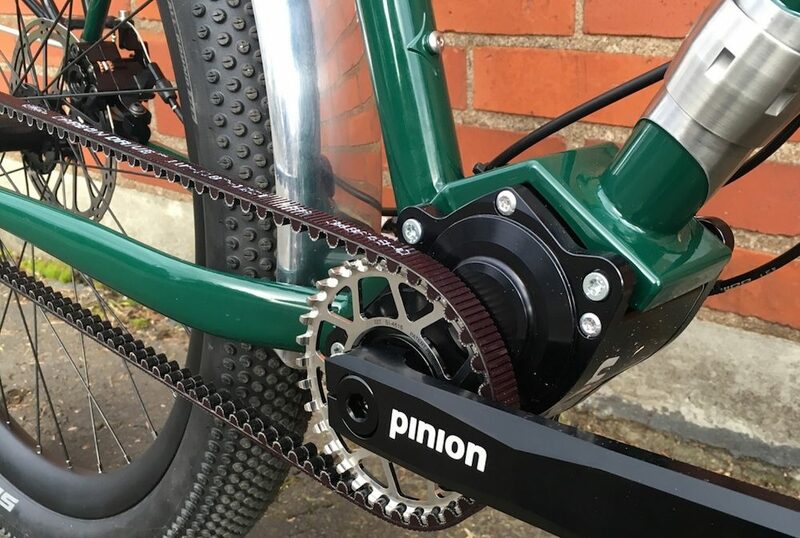 You can read more about Pinion gearboxes HERE. You’ll also notice that the bike employs a belt drivetrain. I’ve been using belts since 2010 and have found that they significantly exceed the lifespan of a regular chain drivetrain. I tend to get over 30,000km on a single belt which can sometimes last the duration of a multi-year tour across continents! 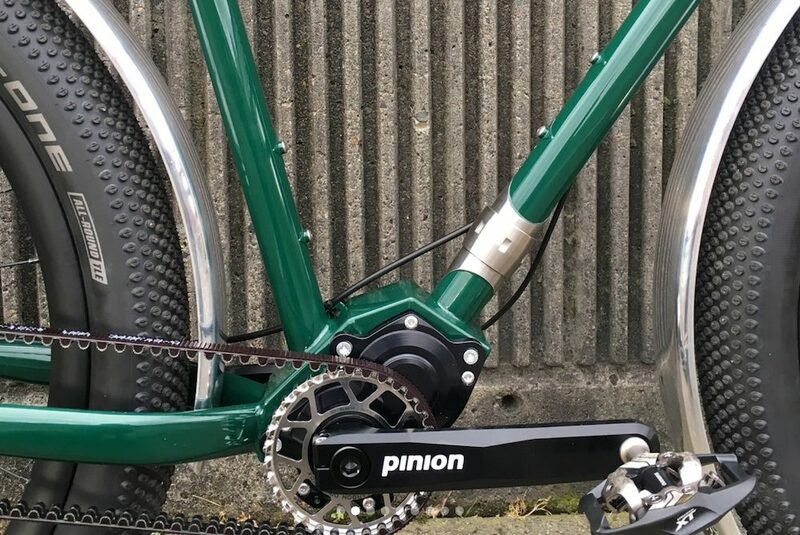 The bike is using Paul Klamper cable disc brakes that fit nicely to the sliding Paragon dropouts. I particularly like the super neat fender strut mount at the top of the dropout. The thru-axles front and rear are another modern feature on this classically-styled ride. 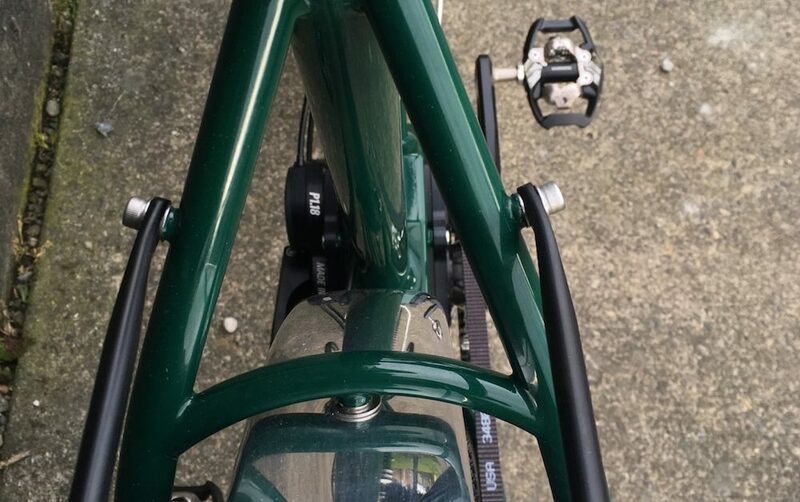 The bike is finished using a Jones Loop handlebar that is quite high in proportion to the seat which should provide a comfortable position for all-day riding. Word from Joseph Ahearne is that the seat and seatpost are only temporary. I look forward to seeing this bike covered in dust and mud!